We knew that already but it's always nice to see people talking about it. 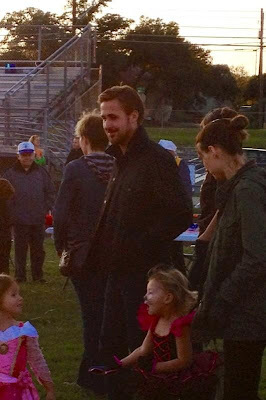 Just when you thought Ryan Gosling's insides couldn't get any more beautiful than his outsides, this photo of the actor at a charity event for the Texas School for the Deaf in Austin emerges. Gosling, who is shooting Terrence Malick's new movie in the area, stopped by the Spooky Skedaddle 5K with his director and co-stars: Michael Fassbender and Rooney Mara. "Ryan was extremely kind, allowing lots of photo ops with fans and when the director told him, 'Enough,' he said, 'No, one more,' and pulled a small deaf child out of the line for a picture," Anne Adams, the executive director of the Texas School for the Deaf, told E! News. Thank to @Calihi27 for the tip.